“Dawn of Glory” on a sunny October day, 2018. Today marks the 100th anniversary of the end of the First World War. At the 11th hour of the 11th day of the 11th month the Armistice, ending hostilities between the Central Powers of Germany and Austro-Hungary and the Allied Powers, went into affect. “Dawn of Glory” stands behind fencing while renovations are made to Highland Park. Dedicated on July 24th 1924 before a crowd of 10,000, this larger-than-life, half-clothed, allegorical, male figure honors the men from the local community who served their country during the First World War between April 1917 and November 1918. “Dawn of Glory,” detail, on a sunny October day, 2018. 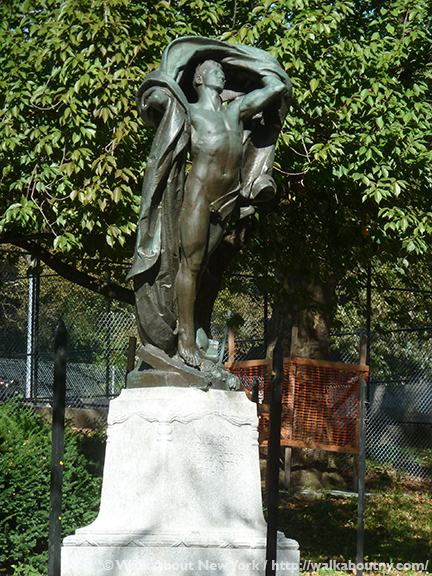 Signore Montana was urged to accept the commission for the Bushwick memorial by local citizens and veterans groups in 1919. As his model Montana chose Angelo Siciliano, known better as Charles Atlas (1894–1972); the bodybuilder legally changed his name in 1922. 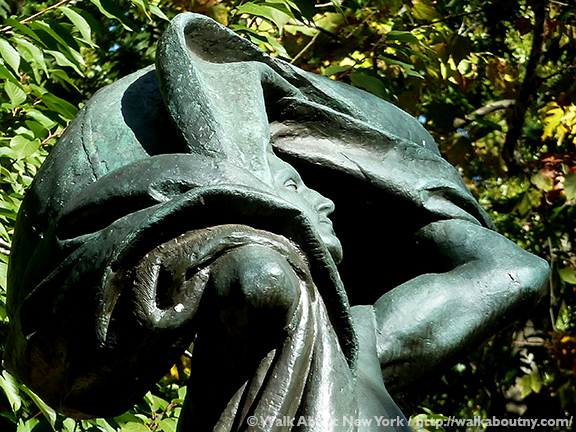 Sensuality is the hallmark of this sculpture, very much in the Art Nouveau style. 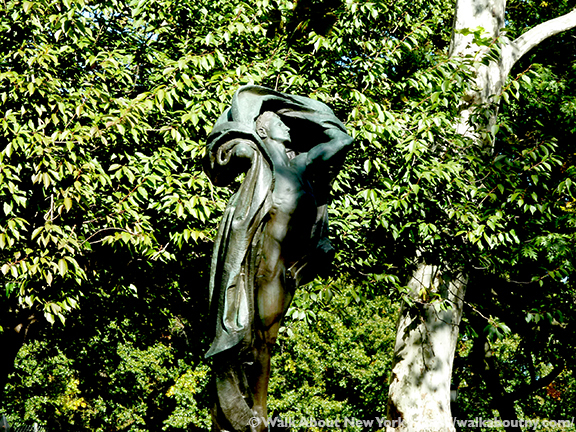 The male figure turns his face skyward as he sheds his clothes, giving the impression that he is unveiling himself to the viewer. The figure serves as the physical embodiment of the spirit of those who gave the ultimate sacrifice for the United States; and they live in glory ever after. A salute from the 106th Infantry was given at the dedication. A soldiers’ victory over death, with the hero casting aside his shroud and ascending to glory, is Montana’s effort to link death in battle with the Christian theology of the resurrection. This unusual and symbolic representation of the American soldier of World War I is not as literal a representation as Montana’s “Fight Doughboy.” “Dawn of Glory” underwent renovation in 1936, and again in 2001, when it was repatined, waxed, and the base cleaned. 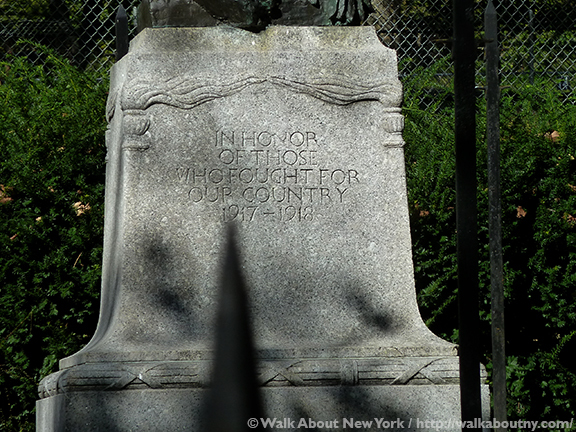 The inscription chiseled on the pedestal reads, “IN HONOR / OF THOSE / WHO FOUGHT FOR / OUR COUNTRY / 1917-1918”. 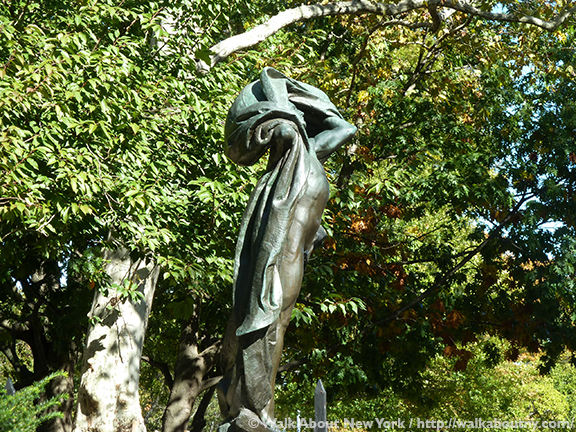 The artist strongly advocated for traditional figurative sculpture and the powerful influence its symbolism could have on the public. “Dawn of Glory” was one of his many efforts to have an impact on the public’s relationship with art and power it can have in our lives. The Kings County Chapter of the American Legion commissioned the work with the input of local citizens lobbying for Signore Montana. 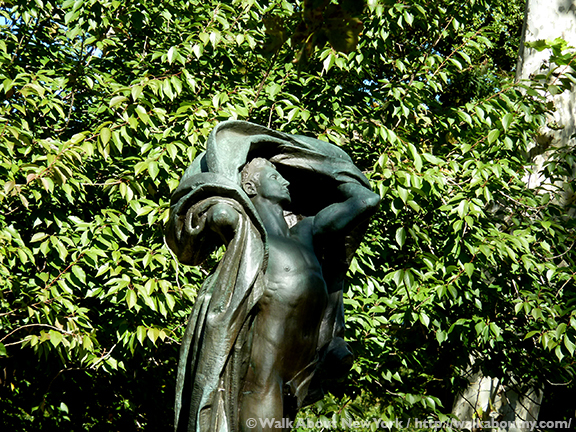 The ten-foot tall bronze figure stands on a pedestal of five feet carved of Deer Isle granite. Other examples of the use of Deer Isle granite in the Big Apple are the Brooklyn Bridge and the New York Municipal Building. 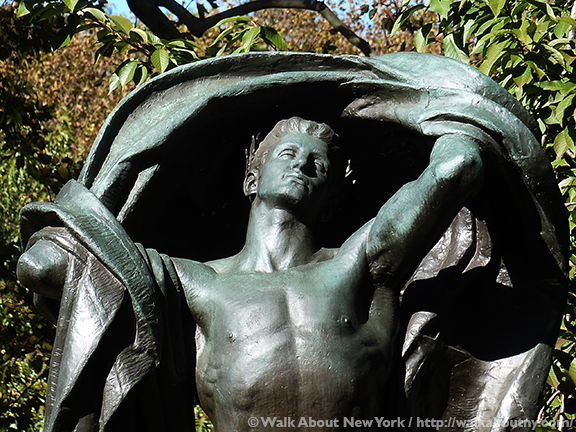 New York City’s own American Art Foundry cast the heroic-scaled male figure in the same year it was dedicated. Commemorating those who fought in the War to End All War from Bushwick, Brooklyn this monument is meant as a link to the neighborhood’s many Italian immigrants, who began settling here in the late 1800s. Immigration was at an all-time high in the 20 years before the start of the First World War. Italian and Italian-American doughboys, as U.S. soldiers were called in the early 20th century, fought for America in the Great War; they had the option to fight for Italy, which was a member of the Entente, the alliance that included Great Britain, France and Russia. When Italians first immigrated en mass to the United States in the late 19th century they were seen as uneducated; they had problems learning English; and they suffered the negative stereotype of the Mafia. The First World War would help them move toward greater acceptance. Italian immigrants, fighting for the Allies, demonstrated acts of heroism. 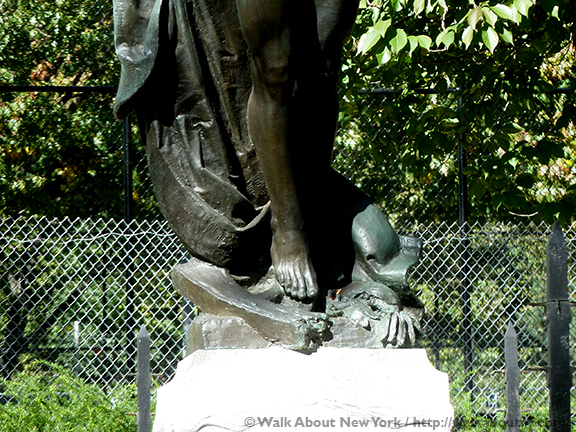 “Dawn of Glory” represents all soldiers of the Great War, but especially the Italian immigrants who settled in Bushwick. Signore Montana, born in Alcamo, Italy, moved with his family to the United States as a child; the family settled in Brooklyn. A 1915 graduate of Cooper Union his three public monuments, honoring fallen World War I soldiers from different Brooklyn neighborhoods, of the early 1920s established his reputation. The upright torches on the pedestal of “Dawn of Glory” symbolize the flame of life burning eternally. Signore Montana’s work is displayed in Greenwich Village too. The year following the completion of “Dawn of Glory” he finished a bronze, bas-relief tablet with text and portraits of Washington Irving (1783–1859) and Mark Twain (1835–1910). Today the plaque can be seen on the north wall of 11 Fifth Avenue, an apartment building called The Brevoort, at the southeast corner of Fifth Avenue and East Ninth Street. At this corner of the land where The Brevoot stands today there was an 1851 brick townhouse, 21 Fifth Avenue, designed and built for the Brevoorts, an Old Dutch family. Mr. Irving and Mr. Twain had lived there but at different times. Montana helped form a society of Italian-American artists, which established the Leonardo da Vinci School of Art on the Bowery in the mid-1920s. Montana had set-up his studio in different locations in Lower Manhattan and then in Midtown; he lived on Kossuth Place in Brooklyn. 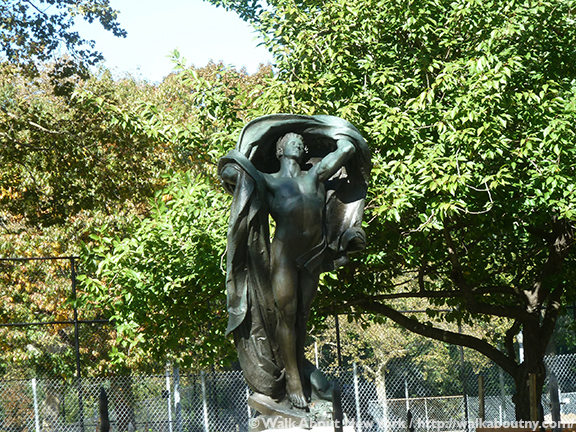 Over a long career Montana worked on numerous public and private commissions; one was a bust of the inventor Guglielmo Marconi (1874–1937) for the 1939 World’s Fair at Flushing-Meadows, Queens, New York. 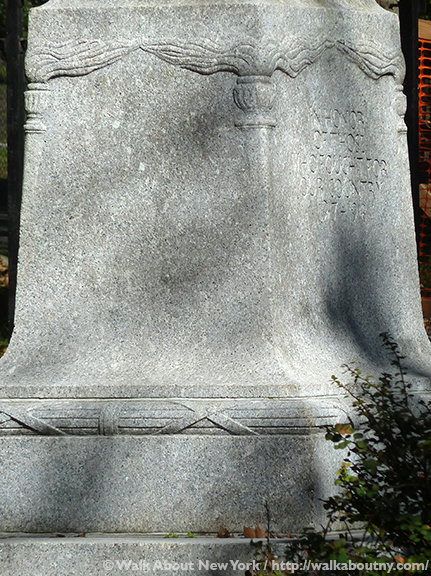 He was a member of several arts organizations; among them were the National Sculpture Society, the Hudson Valley Art Association, and the National Academy of Design. In 1962 Montana returned with his wife, Alfrida Kramer to Italy, where he continued to sculpt until his death in 1978. “Dawn of Glory” in profile. 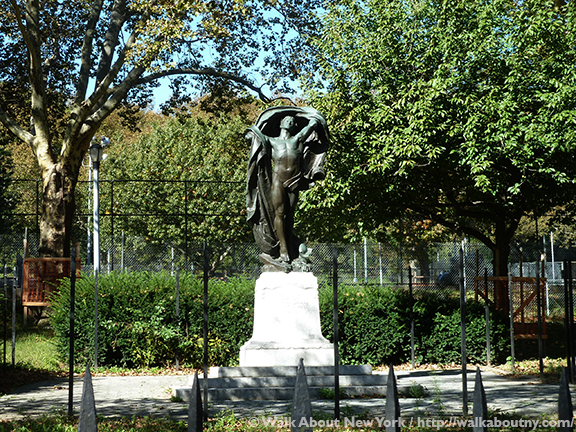 Read our other published articles about the memorials honoring the New York City doughboys who died in the First World War. 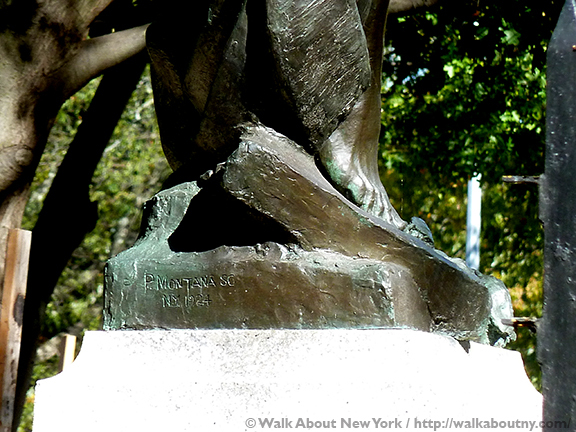 Our Greenwich Village Walking Tour makes a stop in Abingdon Square, where another World War I memorial stands. Why were soldiers in this war called doughboys? Take the Tour; Know More!